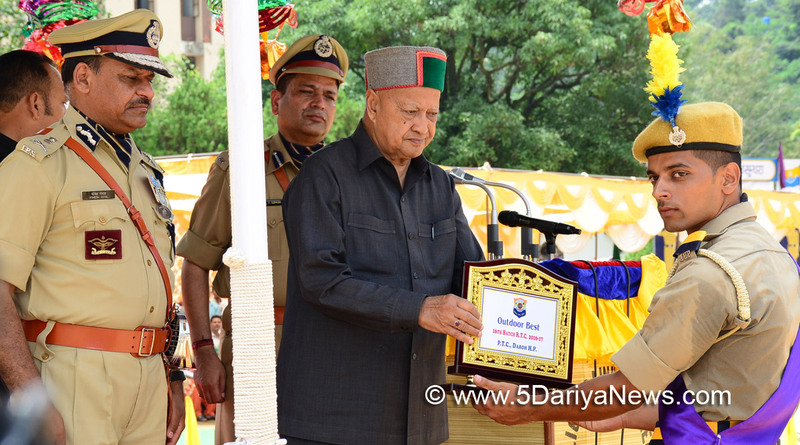 Chief Minister Virbhadra Singh while presiding over the passing out parade of 16th batch of police recruits at Daroh in District Kangra today said that the main motive of the ‘Khaki’ was to eradicate evil from the society and deal with criminals strictly. He said the responsibility of protecting the property and people of the state rests on shoulders of the personnel and they should ascertain that the anti-social elements do not creep in to disturb law and order and create fear in the society. He added that the image of the State as well as of the Police department rests on them.He said that the batch which passed out of training today would certainly augment the trained manpower of state police.The Chief Minister acknowledged the working challenges of the Himachal Pradesh Police. He said that the state government had sanctioned 1073 posts of constables and the recruitment process was underway besides the recruitment of sub inspectors had been completed and would be given training at Daroh Police training college soon.He hoped that training will help them to be a true professional police personnel and encouraged them to come forward and accept the challenges of policing and meet the responsibilities. The Chief Minister exhorted the police officers to be sensitive to the security needs of women and protect the poor and weaker section of the society, besides advising the passing out cadets to be more practical and professional for maintaining law, order and exercising patience while dealing with the people.He said that that there always remains a gap despite good governance and policing and it becomes our duty to deal with endurance and effectiveness. He said that few people for their political benefits unnecessarily flare up the issues. Himachal has a very low percentage of crime rate, he said adding that in the recent infamous Kothkhai case, besides best efforts of the police to crack the same and nab the culprits, lots of hullabaloo was created by the few in Opposition.“I personally wrote to the Prime Minister of India to hand over the case to Central Bureau of Investigation (CBI), not because our police was inefficient, but taking into consideration the voice of the people”, he said. Now the CBI was dealing with the case and urged for three months extra time to submit the status report in the case, but the High court ordered them to submit it in two weeks, he said. The CBI should not make further delay and should go ahead to nab the culprits at the earliest.The Chief Minister announced a sum of Rs 25 lakh for overhead water tanks of one thousand litres and changing water pipes, Rs 20 lakh for installation Solar lights in the campus of PTC Daroh. He also announced Rs 6.50 lakh for Bio-digesters in all the buildings of PTC, Daroh. Earlier, the Chief Minister took salute from impressive march past presented by the participants including both men and women police contingents from Southern range, Northern Range, Central Unit and Reserve battalions. During the nine months long and hard training they acquired the skill in Law, Police science, criminology, Computer application, cyber crime and human rights with emphasis on professionalism, discipline and good behaviour, said DGP Somesh Goyal.For effective community policing the passing out batch have been sensitised on gender issues, crime against women and children and senior citizens as well, with special emphasis on safety of women, said Sh. Goyal.DIG, Northern Range Shri JP Singh while detailing about the training process stated that for upcoming 17th batch, as many as 52 trainees were being imparted training at Daroh and 149 trainees of 18th batch were undergoing training in third reserve battalion, Pandoh.As many as 785 police personnel were given training at Police Training College (PTC) Daroh. Besides 269 women police personnel were trained in 2nd India Reserve Battilion (IRB) Sakoh and 184 at 1st Himachal Pradesh Armed Police at Junga in 16th batch. An impressive commando skill show formed part of the function besides cultural programme and other acrobatics display. Speaker Shri Brij Bihari Lal Butail, Chief Parliamentary Secretary Shri Jagjeevan Pal, MLAs Shri Sanjay Rattan, Shri Ajay Mahajan, Shri Yadvinder Goma, Chairman Education Board Shri Balbir Tegta and senior police officers were present on the occasion amongst others.